In card making, good cutting tools are very important. Below are some of the basic cardmaking cutting tools you will need to give your cards that professional neat look. There are various sizes of cutting mats in the craft supply stores. Choose one that is big enough for cutting bigger sizes paper. I have a 45cm x 60cm green mat with measurement squares which I placed on my worktable. When I need to cut my big sheets of paper, I usually throw that on the floor for more elbow space. Tips: You might like to buy another smaller one to carry around when you need to work somewhere else. Many crafters like to use the X-Acto craft knife. 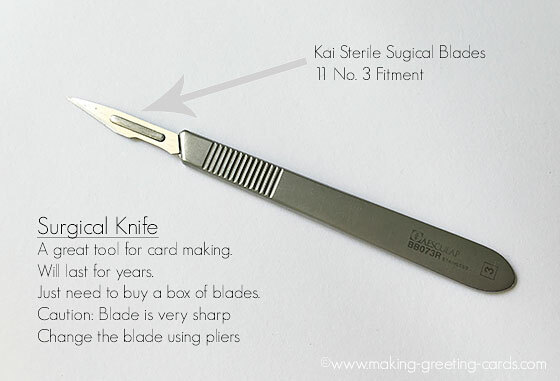 For myself, I went to the local medical supplier and purchased a KAI no.3 surgical knife and blades. A box contains 100 blades which will last me quite some time. I prefer this to other blades because I do lots of detailed paper-cutting. But I also use an X-Acto knife to cut big sheet of paper and also for other non detail papercutting. For those who have difficulty handling sharp knife, I would advise that you use an X-Acto knife as it is safer than a surgical scalpel. Another alternative is to use a pair of scissors for all cutting purposes. A big pair for cutting big sheets and bigger projects and a small sharp one for cutting small pieces of work. Tips: If you don't have a cap for your knife, use a bottle cork and poke the knife into it. This will shield the blade and help prevent any accident. I used my paper trimmer and my mini-cutter often; almost every day. 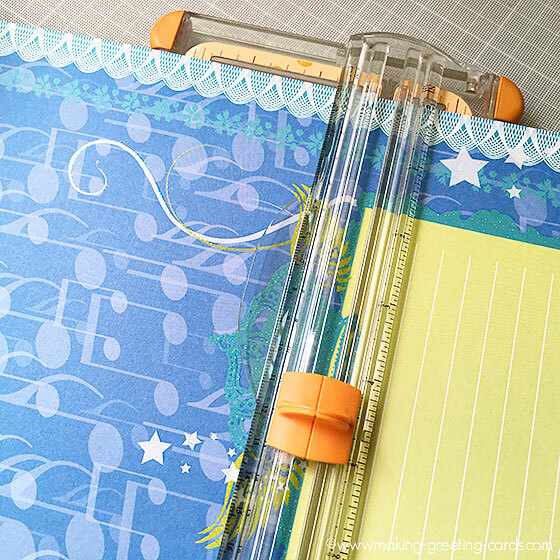 The Guillotine paper cutter is another tool that I use very often. I use it mainly for cutting whole stack of papers or thicker card-stock. The mini-cutter is especially useful for precision cutting of photographs and smaller sizes papers for layering. It is also known as a photo trimmer and often seem in photo studio where you go to develop your photos. Many a time, I see photo shop store-keeper trimming I.C. photos with this. 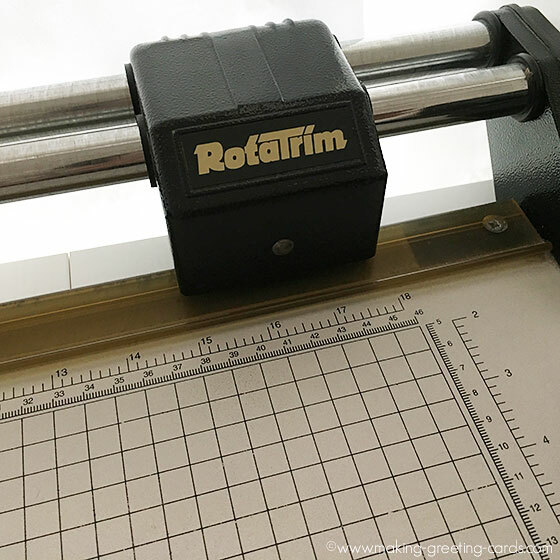 Another great paper trimmer I have is the RotaTrim (below). I purchased it from a local seller on eBay cheaply many years back and since then have been using it over all the other paper trimmers I own.